Zahara Toto in her leg over pose and inset are some of her business friends, Don Bahat in white and Wajjala of the One Million Dollar. The Ex-Chilli Gal'z dance crew member, Zahara Toto is enjoying her job after switching from music to a TV host. She is Spark TV's Live Wire Gossip Show host, a program she co-hosts with Anatalia Ozze. Live Wire borrows a leaf from Bukedde's Olugambo and Urban TV's Scoop on Scoop which shows are very short, normally five minutes for airing all stories coupled with ads, Live Wire is an hour's show from Monday to Friday starting 8pm to 9pm. In 2016, she was fired from Club Play as the PRO. 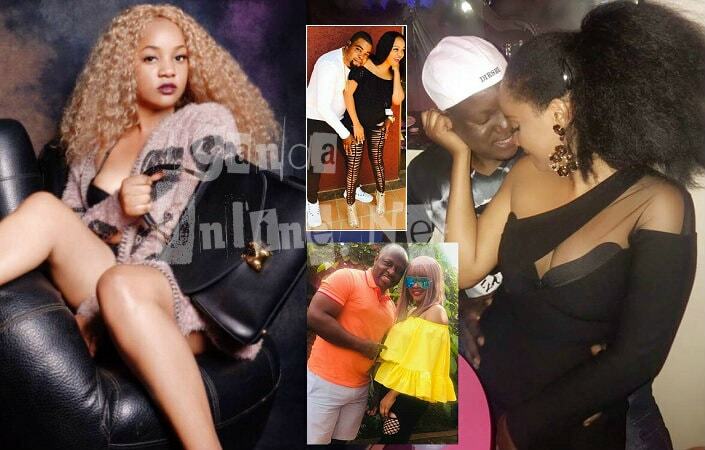 Club Play is where Don Zella held, her Red and White party, this forced the mom of four to cover the Zari All White Party and Anatalia Ozze, to cover the Don Zella event which took place on the same day. They had struck a deal that as sponsors to her(Don Zella) event, Spark TV was not to cover Zari's party, but they did. This did not go down well with Sheila Don Zella, who immediately took to her Facebook page to let everyone know about how Spark TV breached the contract by covering Zari's event. Don Zella's manager, Ronald Cox Kibedi, has since been ranting bitterly over how they paid a lot of money to Zahara and her team not to do certain things like covering Zari, but they still went on to do it. Short of that, Zahara Toto has not only enjoyed the festive season, but her job as well that has taken her places and also let her hobnob with foreign artists like Wizkid among others. In November, she was in South Africa to cover the Star QT Awards, it is there that she became so close to Don Bahat. That month ended with the first party which was the One Million Dollar party by chef Joseph Wajjala, apart from Irene Ntale falling, there wasn't much to write home about. In December, she was one of the hosts for the Pearl of Africa Fashion Awards, then jumped to taking selfies with Wizkid and Swanky from Nigeria and of course she was hosting the Money and Power Party by her good friend Don Bahat.